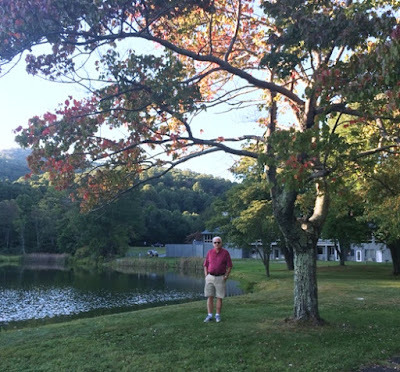 On a recent trip, we discovered the beautiful RoanokeValley in the Blue Ridge Mountain region of Virginia. The city of Roanoke is the largest metropolitan area along the Blue Ridge Parkway, but there are plenty of small towns to visit with wonderfully friendly people. Although we checked out several counties over four days, we didn’t cover the entire Blue Ridge Parkway. I’d love to come back and explore the full 469 miles of picturesque scenery that runs through Virginia and North Carolina. This thin ribbon of road on the ridge of mountains that are older than the Alps or Himalayas connects two national parks--Shennandoah and Great Smokey Mountains. Mountain reflections in Abbott Lake. With a 40 mph speed limit, the Parkway is designed for leisure travel. To really enjoy the views, visitors should take their time and schedule numerous side trips on foot, horseback, or bicycle or by boat. That's the best way to understand why the Blue Ridge Parkway is called America's Favorite Journey. Opportunities are plentiful for breaks on your road trip. Explore, discover, and renew your spirit on trails, at overlooks, and also at concerts. 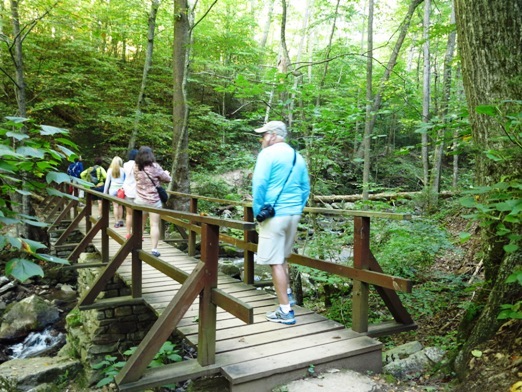 Hike through serene natural areas and learn about historic sites. Trails vary from short jaunts that are great for stretching your legs to longer excursions in the mountains. 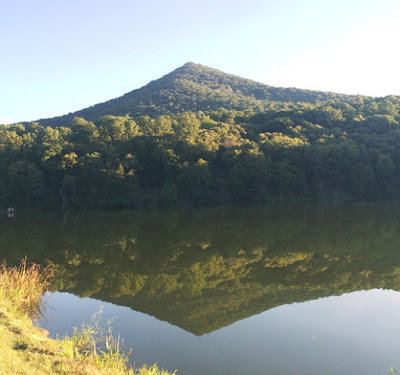 Well-known trails include Peaks of Otter, Rocky Knob, Humpback Rocks, and along the James River. At Roaring Run, a six-tenths mile trail featuring scenic bridges, overlooks, and a waterfall, an old historic furnace is the focal point. 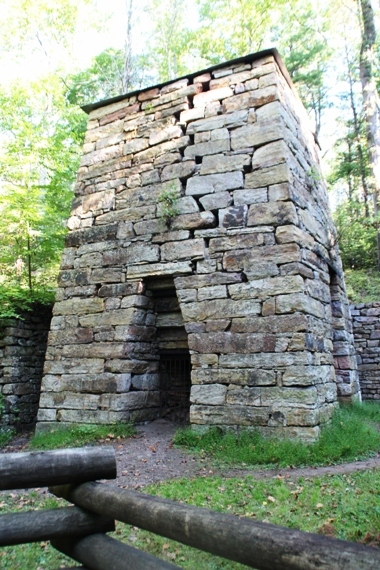 historic furnace at Roaring Run. Bicyclists have a little more difficulty as elevation ranges from 649 to 6,047 feet, and there are no dedicated bike lanes on the Parkway. But, if riding is your thing, the Blue Ridge Mountains in southwest Virginia provide some of the best mountain biking on the East Coast. Parks like New River Trail State Park, which runs parallel to the New River for 39 miles, offer excellent biking trails. Virginia’s Explore Park, at milepost 115 on the Blue Ridge Parkway, just east of Roanoke, offers terrain for bike riders of all skill levels. Despite its name, New River is reputed to be the oldest river in North America. It’s designated as an American Heritage River, and small boats can easily navigate its class 1-3 rapids. 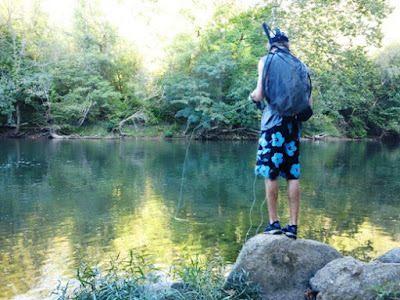 The James and Roanoke Rivers are also suitable for paddling by canoe or kayak. Spend a day swimming or boating at Smith Mountain Lake, the “Jewel of the Blue Ridge Mountains.” Located in a state park in Franklin County, it is the second largest and most popular freshwater lake in Virginia. 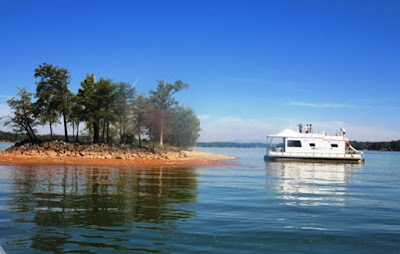 water fun--swimming, fishing, house boating, sailing, and more. More than one-fourth of the Appalachian Trail lies in Virginia. The AT roughly parallels the Parkway from mile 0 at Rockfish Gap to mile 103 and can be accessed from numerous locations in the Blue Ridge region. 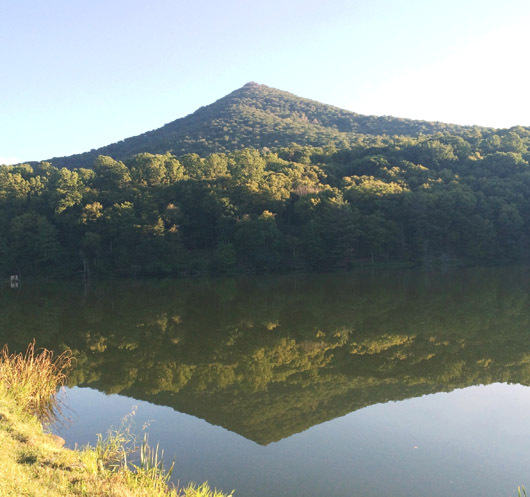 If you choose to hike the AT for a few hours or for weeks, you’ll enjoy some breathtaking views. One of the most photographed spots on the AT is McAfee Knob with excellent views of Catawba Valley. It’s easily accessible just west of Roanoke on Rt. 311 and will take a couple of hours to complete round trip. Fishing is a popular activity at rivers along the Blue Ridge Parkway. Horseback riding, farmers' markets, and music concerts are other attractions. The Roanoke Valley offers a variety of lodging choices for every budget including historic hotels, luxury waterfront suites and cottages, small hotels, and camping spots. Stay at one place and take day trips, or drive along the Parkway each day, stopping for various activities along the way (That’s what I’d like to do). During our mid-September visit, leaves were just hinting of color, so I think October would be a perfect time to return. Cool temperatures, trees splashed with brilliant fall foliage, and great hiking weather would make this a memorable drive. To help plan your trip, get the official publication of the Blue Ridge Parkway Association, which includes suggestions of places to pause or stay and their milepost locations. Wow, a very beautiful and fascinating place to visit. I will admit that when I have been to the US it has only been to cities so far but I so want to see all the amazing countryside and wilderness it has to offer! Beautiful spot! I've never heard of it but that just adds more charm to it! Looks like a beautiful area of the US. We have never been to Virginia but have heard of the Appalachian Trail, maybe a trip to our neighbors to the south is in order next year. I absolutely love your spirit. Keep visiting places and keep telling us teh stories. Looks like a very beautiful place to walk around, but the speed limit for cars seems very low. At 40 miles/hour you can't get very far and you'll need more time to explore the area. Looks like a great place to relax and be one with nature. I would try hiking and biking.